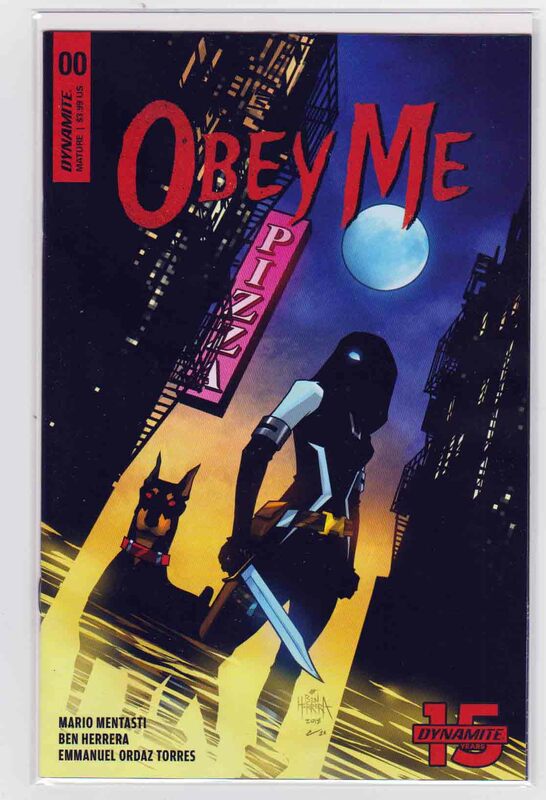 Obey Me #0 (2019) Ben Herrera Cover & Emmanuel Ordaz Torres Pencils, Mario Mentasti Story, Based on the action game Obey Me Based on the action game Obey Me on PC and consoles. Locked in a millennial conflict, the forces of Heaven and Hell wage war in the Material Realm using servants and mortals as proxies. Vanessa Held is a low-ranking lesser demon serving Ammon, the Archduke of Greed. She takes part in missions to further her boss' plans while collecting the souls of those who had sold their soul to him. Join Vanessa and her Hellhound companion Monty through their assignments, becoming more powerful while taking on demons, corrupted humans and more. Welcome to the world of "Obey Me".A wicked Mafia Don sold his soul to the devil and thought he could escape the pact. Ammon, the demon who sealed the pact is not having it, so he has sent one of his operatives to take the soul that is his property. Vanessa Held is tasked to find the target and reap his soul and for that purpose, she will be joined by Monty, a demon who committed a great sin and was punished, becoming a Hellhound, a familiar of sorts for younger demons, to serve as a mentor and guide.